A lot of people fine this odd, but until last week, I never owned a tablet. Seriously. I just never needed one. I have a big-screen smart phone (an LG V20, to be exact) that works for things like checking email and such, and I still read paper books when I can. I always told myself that the first time I wanted to read a book that wasn't available on paper, I'd buy a tablet. Well, that day came a couple of weeks ago. I was looking for a good book on PHP to brush on up my skills, and the one I wanted wasn't available in a dead-tree edition. In all honesty, I was pretty happy about it because it gave me an excuse to buy a new toy. So I started looking around, and I decided to buy an Amazon Kindle Fire HD 10. My reasons were that it was an excellent tablet at its price point, it would do everything I needed to do with it, and I'm an Amazon Prime member. The reason that last part is important is because Prime includes lots of free movies, music, and other content that can easily be played on the Kindle, which is above all a gateway to all your Amazon content. 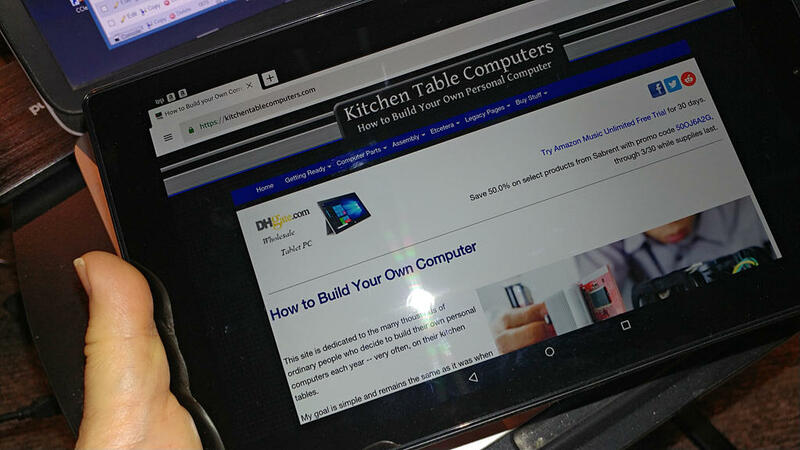 What I needed in a tablet was the ability to read books in various digital formats, an SSH client, a Web browser, and an email client. Pretty much any tablet can do those things. But the Kindle Fire HD 10 also has quick-and-easy access to all my Prime content, making it a good toy as well as a good tool. All in all, I'm very satisfied with the Fire HD 10's hardware. With a Quad-Core at 1.8 GHz with 2 GB of RAM, it's hardly bleeding-edge. but FireOS (an Amazon-customized version of Android) doesn't need it. The response was quick and smooth no matter what I was doing with the device. The display is a 10.1" touch-screen with 1920 x 1200 resolution at 224 ppi. Video playback is 1080p Full HD. The screen has a polarizing filter to cut down on glare. I found it to be excellent for both working and watching movies. The ambient light sensor works well and quickly adjusts for different lighting situations. The sound using the built-in stereo speakers is decent enough, but is very good with a decent set of headphones. The battery life is also very good. I watched a nearly hour-long episode of an Amazon series at about 80 percent brightness and used about 12 percent of the charge. If that extrapolates out, it would mean I could watch somewhere between seven and eight hours of video on a charge. Amazon claims up to 10 hours, which I think is certainly doable at a slightly dimmer brightness setting. Full charge from 15 percent took about four hours. The built-in WiFi worked fine on every connection I used, at both 2.4 GHz and 5 GHz. Two things I'm not to crazy about are the charging port and the cameras. The charging port is Micro USB, which is less durable than USB-C and requires inserting the plug in the correct orientation. Just be careful, and it should be fine; but I hope the next version has USB-C.
As for the cameras, in my opinion, they're the only part of the Fire HD 10's hardware that I'd rate as poor. The quality of the VGA front-facing camera rivals the first digital camera I bought in the 1990's. If you do a lot of video chatting, this may not be the tablet for you. The quality of the 2 MP rear-facing camera is slightly better, but still nothing to write home about. Because I need to SSH into my servers quite often, I also wanted a decent case and keyboard. A device like this is perfect to allow me to access my servers while traveling, if I have a need to. It's small and lightweight, so I can just grab it on my way out the door. That means I can respond to a server emergency from any place where my Verizon Jetpack can grab a signal. 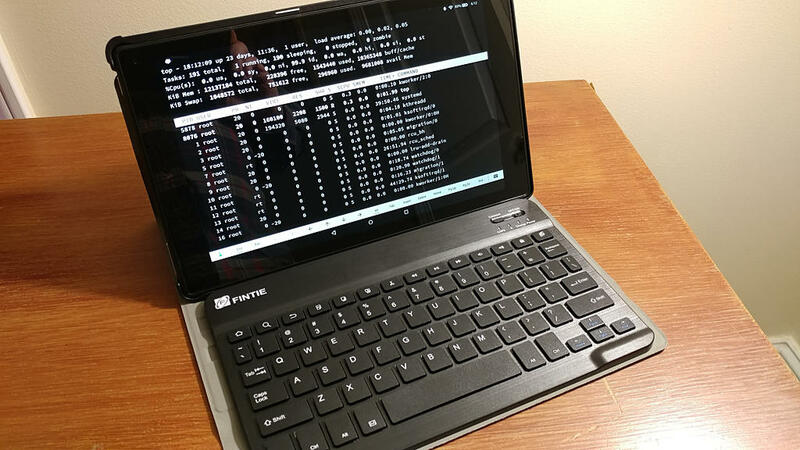 Here's the Fire HD 10 with case and keyboard accessing top on one of my servers (the one hosting this site, actually) using SSH. The case and keyboard I wound up buying were a bundled Fintie case with a detachable Bluetooth keyboard. The keyboard works great and can be used for days on end on a single charge. 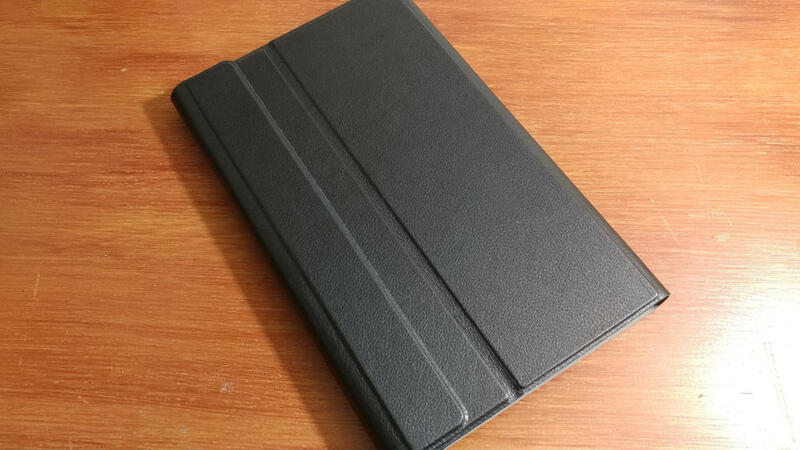 The case is sturdy and also is magnetized to hold the keyboard in place, while making it easy to detach to shed some weight if I want to hold the Kindle like a book to read. 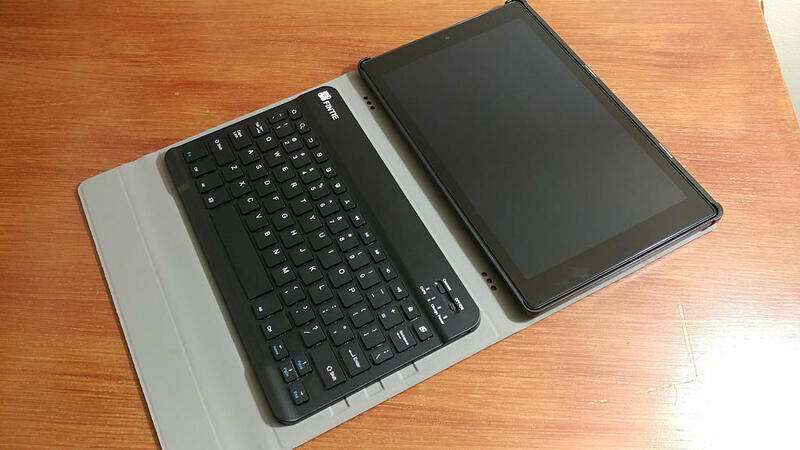 If you buy a folding case like that, be sure to lay a piece of something like micro foam packing sheets or microfiber cloth between the keyboard and the display. I personally use the micro foam. Although the Fire HD 10 does allow you to install applications from outside the Amazon App Store if you enable that option, they won't run if they depend on Google Play services. Some users have reported successfully installing the Google Account Manager, Google Play Services, and Google Play Store on the Fire; but it's quite an involved process and certainly is not supported by Amazon. What that means is that unless you want to hack your Fire HD, you'll be limited to apps in the Amazon App Store and Android apps that don't require Google Play Services. For most users, that shouldn't be a problem. The Amazon App Store is thinner than the Google Play store, but most of what the average user needs will be in there. I do suggest you browse the store first, however, to make sure the apps you want are there before you buy a Kindle Fire device. This is where the Fire HD 10 shines. If you're a Prime member, you can access thousands of movies, television shows, music, books, magazines, and probably a lot of stuff I don't even know about as part of your Prime membership. You can also subscribe to HBO, Showtime, and other subscription services. Also included are photo storage for all your photos, backup for your Kindle devices, and the ability to download content to the device's internal memory or Micro SD card for offline use. That means, for example, that you can download a bunch of movies and take them with you to watch at night in the cabin while you're on a fishing trip. Alexa is Amazon's voice-operated virtual assistant. You can ask her questions and she'll search the Interwebs for the answers, control various other devices like smart thermostats and lights, make a shopping list and add items to it as you think of them, place Amazon orders, set alarms, open Web pages, and all sorts of other things. Alexa can also read audio books, make video calls to other people with Alexa-equipped devices, and dial a phone that's paired to the Fire by Bluetooth. At its very low price point, the Fire HD 10 is a great value hardware-wise. No, it's not as powerful as the highest-end tablets on the market. But it can be had for about one-tenth the price. Aside from the cameras, there's really nothing to hate about this tablet's hardware. Whether it will work for you, however, depends upon how you want to use it. If you're a Prime member, then it's a no-brainer. This tablet was built for Prime. There is no easier way to access your Amazon content than with a Fire HD tablet. The only reason I can think of not to consider the Fire HD 10 is if there are apps that you simply must have that are not available on the Amazon App Store. Unless you want to hack Google's support services onto the device (and risk whatever warranty or other problems that might cause), your app choices for Fire devices will be much more limited than on either a Google Android tablet or an iPad. In my case, that wasn't an issue. Everything I needed was available from Amazon's store. But that might not be true for you; so check the store before you buy the device. As for me, I'm happy with the Kindle Fire HD 10 and am glad I bought it. It will do everything I need it to do, and it saved me hundreds of dollars compared to more-expensive tablets of equivalent quality. It's a perfect fit for my needs.